Printer can print consecutive identical characters in one go. It can replace consecutive characters by consecutive identical characters at any position. You are given a string input with some characters. Write an algorithm to find the minimum number of printer operations required to print the input string. This problem is similar to “Remove boxes” problem. We will try to club identical characters so that printing them all together will minimize the total number of operations. Take the example input: “aba”. If we take out ‘b’ from the input string, the remaining string will be “aa” which can be printed in one operation. 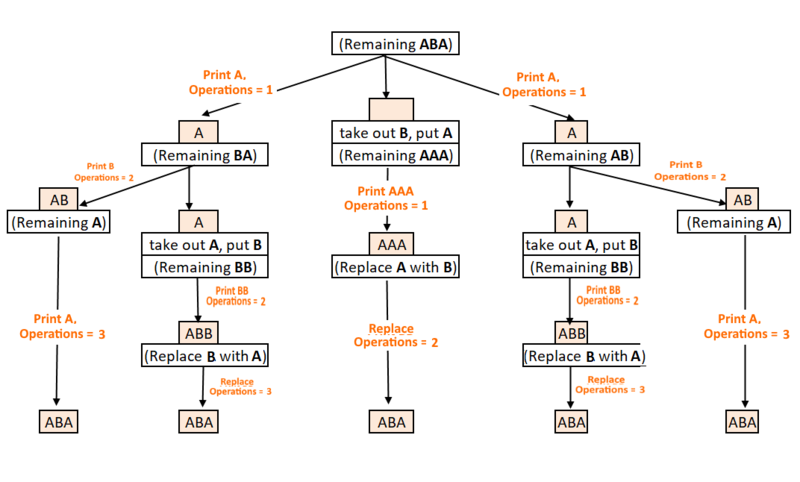 One thing is left is ‘b’ which can be printed by replace operation. So when taking ‘b’ out, print ‘a’ instead and later replace it with ‘b’. Leave the option chosen in the step 2 and follow the same approach taken in step 2 starting from index where step 2 has ended. Solve the remaining string (which includes the option from step 2) recursively. Each option will produce a result, choose a minimum among those.